How is Precompression Applied in Compaction of Foundation Soil? Precompression is a process in which a soil mass to be used as foundation bed is preloaded to improve its properties and then design loads are applied. It is normally used in improving properties of cohesive soils. The preloading results settlement to soil before construction process starts. Preloading is applied with a mass of earth fill which is left above area for a long period. The period is determined by the adequate settlement or desired settlement. Now question is how settlement is calculated? A system of monitoring is provided by using settlement plates with piezometers to check the progression of settlement of foundation soil. Sufficient geotechnical investigation for the work site is performed to have a sound idea about magnitude and rate of settlement to be applied as described above. The preload should select carefully to avoid shear failure. The stability of soil deposit beneath preload should be evaluated carefully. When a sufficient settlement is achieved, the construction is started removing preload. 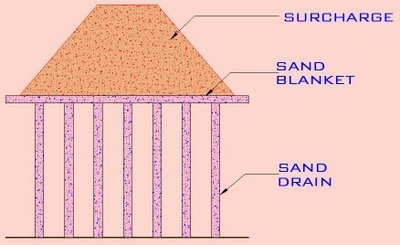 Sometimes to accelerate settlement a system of vertical sand drains are provided. In the previous post we have discussed about vertical sand drain. This process of compaction is used successfully for clays, silts, sanitary-landfills and organic soil.